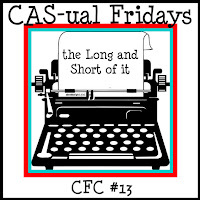 Today's little number combines two challenges, CAS-ual Fridays and CASE Study. CFC #13 required the card to be 4"x9". I think I was feeling a little zen mojo this morning, because I was in a minimalist card making mood - must have been the early morning light, and pure silence (which is hard to come by with two young kids). And here's another card - obviously, this was made later in the day, when I was in full gear, with my usual chaos swirling around me. 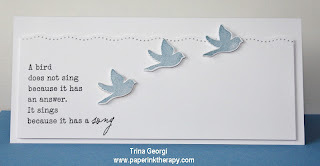 I LOVE this stamp from The Greeting Farm. I've had this for quite some time, but hadn't had the chance to really play with it until my recent purchase of Copic marker...finally, I can play with my "Cheeky" stamps....yippee! Both your cards are fab! I really like the 'peaceful' feeling of the birds in flight and your CAS design. Also glad to see you had some fun with Copics, beware... they are totally addictive, especially with cute images like this one! She is just too cute! The birds in flight across your card, are so peaceful and serene. Wonderful card! I have the border punch that you used, but had never thought to use it in that way. Somehow it gives the impression of clouds in the sky. Love it! The zen mojo was working well there! I love the cool colors and peaceful sentiment. Great job! Haha! Zen mojo - I love it!! I love your cards too, especially your CASE Study entry... so gorgeous! Wonderful cards! Thanks for joining us at Case Study this week! Both projects are fantastic, but I especially love your long card - stunningly gorgeous! Thanks so much for playing with us at CAS-ual Fridays! Beautiful projects! Thanks for playing along with us at CAS-ual Fridays!